Good timing: I just received this press release from the office of Senator Tom Udall of New Mexico. He and representatives from Kentucky and Pennsylvania have drafted legislation that would put horse racing under the authority of the U.S. Anti-Doping Agency. You might remember them from that fellow Lance Armstrong everyone was talking about a few months ago? It’s not quite the same thing. But I like the idea nonetheless. I think the argument that they will make is that since parimutuel wagering crosses state and international borders, it’s international sport. Or something. Anyway, here is the press release. WASHINGTON – Ahead of Saturday’s Kentucky Derby, U.S. Sen. Tom Udall (D-N.M.) and U.S. Reps. Ed Whitfield (R-Ken.) and Joe Pitts (R-Penn.) revealed draft legislation they intend to introduce to end doping in horseracing and kick cheaters out of the sport. The Horseracing Integrity and Safety Act would provide the U.S. Anti-Doping Agency (USADA) with authority to cleanup the sport and enforce anti-doping standards in races with simulcast wagering. USADA is a non-governmental organization that is designated as the official anti-doping agency for the U.S. Olympics and works with sports leagues to strengthen clean competition policies. Horseracing showcases the beauty of an iconic American animal. The industry also has a $10 billion annual economic impact and sustains about 380,000 jobs nationwide. Last year, over $10.8 billion was wagered on American horseracing, including $133 million for the Kentucky Derby. However, as the New York Times reported in 2012, doping undermines the safety and viability of the sport, and twenty-four horses die each week from racing injuries. Ensure racehorse drug administrations comply with veterinary ethics. Last year, Udall, Whitfield and Pitts participated in Congressional hearings that explored medication and performance enhancing drug problems in horseracing. In previous years the lawmakers introduced similar legislation tasking the Federal Trade Commission to improve the sport. Their new approach, however, would enable USADA to act as the anti-doping body without amending the Interstate Horseracing Act or involving any federal agency or regulation. The legislation would not require any federal taxpayer funds. Most of us have one or two special riding instructors in our past who taught us some invaluable lesson. It might be that a-ha moment when you realized where your seatbones actually were, and how they worked. It might be when an automatic release finally clicked for the first time. It might have been a person, or it might have been a clever horse, who taught you that lesson. I learned my most valuable riding lessons at the racetrack. A “cross,” as I understand it, is when you hold both reins in both hands. It’s what event riders do when we “bridge” the reins over a horse’s neck for long gallops or a particularly strong horse. A half-cross is when you hold both reins in one hand. When I am riding in any sort of uncertain situation, I nearly always have my reins in a half-cross like this: right hand on right rein, left hand on left rein, extra loop of right rein in left hand as well. It’s a wonderful feeling of security. I think there’s been some hate going around Facebook about some kind of pose where theoretically advanced riders balance their hands on their horse’s neck instead of maintaining an independent upper-body position, like a little kid when they first learn two-point. This isn’t the same thing. This is pressing one’s hands into the withers, just in front of the saddle, at either the trot or the canter, and letting your weight fall both into your heels and your hands. This is a happy secure place if you keep enough weight in your lower leg, and keep your lower leg in front of you. This is approximately how one gallops a racehorse, except that you aren’t high up in short stirrups, and bent at the waist over your horse’s neck. The security comes from the weight in your leg, ahead of the motion, and the weight in the withers, a spot that tends to be pretty stable even if the horse stumbles. I use this when riding big, strong horses with a tendency to fall onto the forehand and stumble. If they do stumble, my leg catches me. If they are just being strong and pulling, my anchor at their withers ensures that they are pulling against themselves. No, I won’t be winning any awards when I use these techniques. But I haven’t been in the showing business for a long, long time, and I’ve found that for me, anyway, the riding that counts is real world riding — security first! 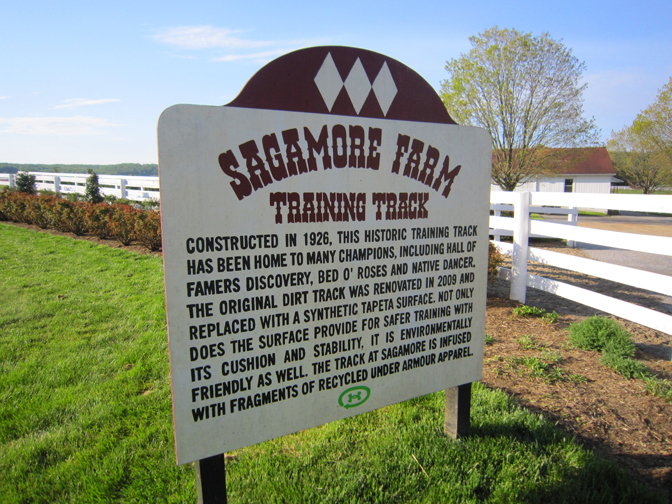 Laurie Berglie was lucky enough to visit Sagamore Farm, a historic Thoroughbred property in Maryland. As a Maryland-bred myself, I’m pretty jealous of her. And after seeing these pictures of the beautiful farm, doubly so. 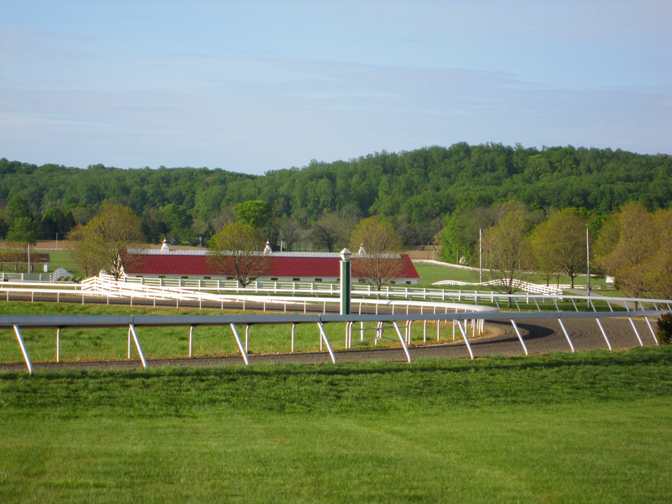 On April 28th, I was granted the privilege of touring Kevin Plank’s Sagamore Farm. It was Friends and Family of Under Armour Day at Sagamore, so I scored admission through a friend of friend. 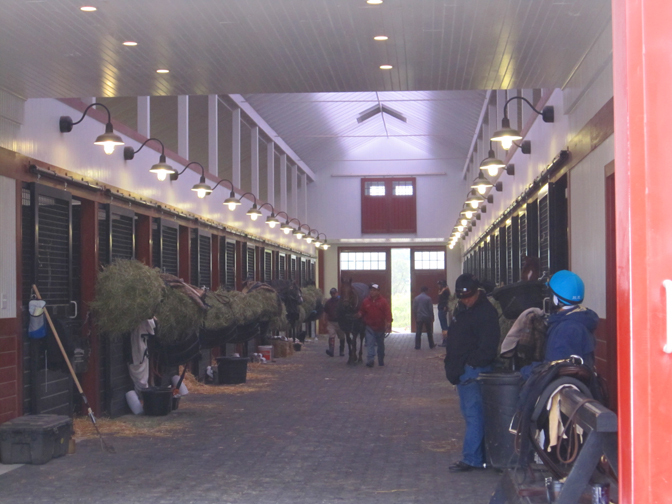 You may know Kevin Plank as the founder and CEO of Under Armour, an athletic apparel company, but in 2007, he purchased Maryland’s historic Sagamore Farm with the hopes of rebuilding both the farm and Maryland’s racing future. And he is well on his way to doing just that. Here’s a little history lesson for you. Sagamore, located in beautiful Glyndon, Maryland, was founded by Margaret Emerson Vanderbilt in 1925. In 1933, she gave the farm to her son, Alfred Vanderbilt II, for his 21st birthday. Alfred had a way with horses and pretty soon he was running a successful breeding and training operation which produced the great Native Dancer. Native Dancer, aka “the Grey Ghost,” won 21 of his 22 races, including the Preakness and Belmont Stakes. When Vanderbilt sold the farm in 1986, it quickly fell into disrepair. Enter Maryland native Kevin Plank. Plank has already restored much of the farm in just five short years and has produced some champion racehorses including 2010’s $2 million Grade I Breeder’s Cup Filly and Mare Turf winner, Shared Account. Plank has a long-term plan to continue refurbishing the farm, (next on the list is to give the indoor track a face-lift), and does not doubt for a second that Sagamore will produce a Triple Crown winner at some point. After a breakfast of doughnuts and coffee, I watched a handful of horses take to the track for their morning work-outs. My favorite was a grey filly, whose name I didn’t catch, who breezed by us at lightning speed. I also enjoyed What’s the Record, a dark bay, 4 year old gelding, who couldn’t wait to get down to business. 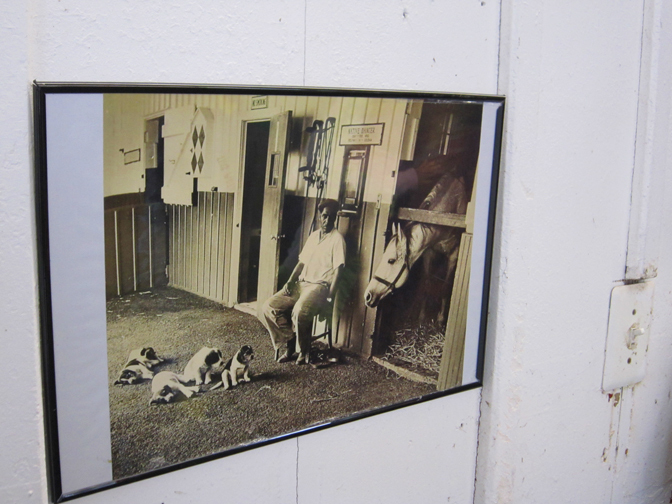 The guided tour began at the indoor training track; then we were led over to “Native Dancer’s Barn.” Interesting fact about Native Dancer – he loved children and small animals (especially puppies), but wasn’t a big fan of grown-ups! (And really – who doesn’t love puppies!?). We peered inside of the training barn just as Tiger Walk, potential Preakness contender, crossed our path. We were led to “the graveyard” where 12 of Vanderbilt’s champions had been laid to rest. Most racehorses are not buried whole with just their heads, hearts, and hooves placed in the ground – but not these 12. According to our guide, their bodies lay intact, covered by their stable blanket, with a bag of their favorite treat (apples, carrots, peppermints, etc.) alongside. Finally we made our way back to the track. 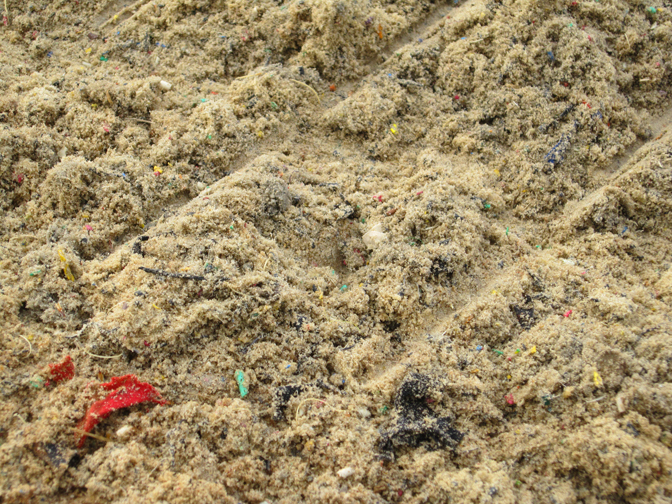 “In 2009, the ¾ mile training track…was rebuilt with a synthetic Tapeta track that incorporates pieces of recycled Under Armour performance material.” Very cool!! Sagamore is hoping for another great year out on the track. Look for Monzon, Tiger Walk, Humble and Hungry, and filly, Millonreasonswhy, to be making headlines! If there is one thing that I would like to take up with author Nicholas Evans (The Horse Whisperer) it is his introduction into polite society the very term “horse whisperer.” It is annoying, if only because it comes up any time any lay person mentions anything about any horse. Or some variation on the above. But let’s face it, as horsepeople, we have all been sorted into two groups by the Outside World: those who are Horse Whisperers, and those who are Not. And so when I was doing a little research on animal communicators, based upon the conversations that author Jane Smiley related in A Year at the Races, wherein she was able to have Q & A’s with her assorted herd of racehorses, broodmares, and saddle horses via one of these fascinating people who claim to engage in interspecies-chit-chat, I found it hard to get past the first line in this article in The New York Times. Not whispering so much as getting a kiss. But, I suppose, every little piece has its place in the puzzle. When you study horse training, you have to go into it with an open mind, and then shuffle around all the conflicting bits of information you receive in order to arrive at your own philosophy. Horse trainers, I explained to a girl at her therapeutic riding lesson the other day—a girl who had serious doubts about the riding instructor’s decision to stop the lesson horse from showing affection to the girl, who was on the ground, while another girl was on the horse’s back—are only alike in that they all have very different and very steadfast opinions on how to train. She, the girl who wanted to stroke the horse being ridden by someone else, was clearly a girl with great empathy for horses; the instructor, who stopped her from stroking the horse, also had great empathy for horses; unfortunately, they had different ideals about what the horse should be doing with his time. She wasn’t impressed by my explanation, of course, although I thought it very reasonable and well thought out, and I think that is usually the case when two horsewomen who are not avowed allies of one another differ on their training strategies: we listen, and disagree, and continue on our chosen paths. We’re very fundamentalist that way. But I have to admit that I’ve never been completely bound by any one philosophy. I dislike gadgets, but I use side-reins, for example. I believe in the prey mentality of the horse, and establishing oneself as dominant, but I’m fascinated by discussions of equine personality. I don’t have a lot to say to people who insist on anthropomorphizing their horses, but I do think horses have opinions, and individual character, and, in varying degrees, ambition, drive, and desires. 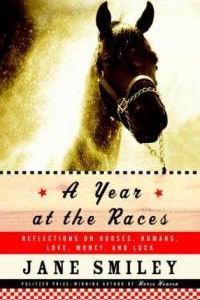 And after frantically flipping through the pages of A Year at the Races: Reflections on Horses, Humans, Love, Money, and Luck, I can tell you, the next time I really want to know what is on a horse’s mind, I’m totally going to call up an animal communicator. That’s really not me, of course, but at the same time, why be closed-minded? When I was having absolutely no progress in connecting with Bonnie, I consulted a book I found at the library, Ride the Right Horse: Understanding the Core Equine Personalities & How to Work with Them by Yvonne Barteau. This is a book I would not have picked up were I not absolutely desperate to create a relationship with a horse who was not interested in me. And trying to create a relationship with a horse was not a problem I had thought about since I decided that the prey social model was the most logical approach to horse training. Now, to be perfectly honest, the book did not salvage my struggling attempt to build a partnership with Bonnie. What it did do, however, was show me that it was probably a lost cause. We just weren’t compatible. She just wasn’t that into me. And, I guess, I wasn’t that into her. You just can’t be compatible with every single horse. And that’s because, sound the alarm bell, let the anthropomorphizing begin, horses do have unique personalities, and drives, and desires, and they’re not always going to sync up to yours. It’s the same reason you just don’t like some of your co-workers. Smiley gets that some horses will simply never love you. The goal of horse training is to mitigate equine idiosyncrasy and to give every horse some fluency in the common language required to get along with people. There are always horses for sale and always buyers, and a trained horse is supposed to function reliably, to walk, trot, canter, jump, gallop across country, stand, cross-tie, be groomed and bathed, ride in a horse trailer, go to a few horse shows, and even foxhunt, or to do similar things as a Western-style horse. But there are horses who show affection, who share a bond with the owner, who do more than perform functions. They actively seek to please. Until you have owned a horse who seeks cooperation and behaves warmly toward you, you don’t realize how many horses were just passing time in your company, half ignoring you or barely putting up with you. I paused after I read that, to take stock. I have had horses like that, haven’t I? Of course. But how many? I thought I could name them. Rillo, my first Thoroughbred. Final Call. Maybe even Rapidan, although I don’t think Rapidan sought cooperation and behaved warmly towards me. He sought something from me: to rile me up, mostly. I don’t think he was half-ignoring me or barely putting up with me, so much as seeing how far he could push me. Playing with me. Masochistic, always hoping I’d yell at him, that was Rapidan. It bears thinking about. And it makes you think about the personalities you have been in contact with. 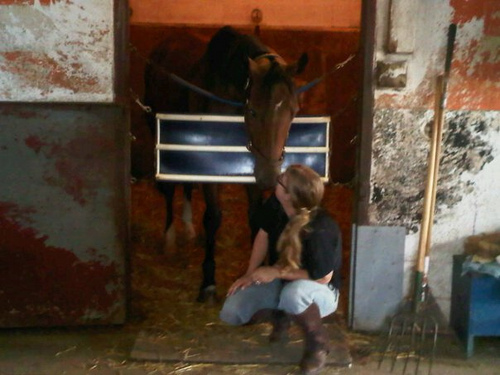 My greatest take-away from A Year at the Races was a deeper understanding of the equine mind. Smiley has studied human psychology and the nature of love and affection much deeper than I have ever had any inclination to, and she has been able to turn this inquisitive nature into a fresh and fascinating exploration of How Horses Think. I will say this: A Year at the Races is an extremely misleading title for this book, just as “book review” is an extremely misleading category for this article. This book could have been called My Horses, My Teachers except that Alois Podhajsky already took that one, or Talking With Horses, except that Henry Blake already took that one, and anyway, both texts are mentioned within this one. This book is a fascinating exploration of equine psychology, what makes horses tick, how they manifest their brilliantly defined personalities in every day encounters, how they tell their riders and handlers and fellow horses what they are thinking through reactions, movements, and vocalizations, and if the stories of Hornblower and Waterwheel, Smiley’s babies at the track during this particular “year at the races,” are neat little bookends and good for anecdotes, the real power of the story is in the explorations of who horses really are. And as for her frequent communications with her horses via animal communicator Hali Jones? Yes, I’m a believer. It makes just as much sense as whispering. 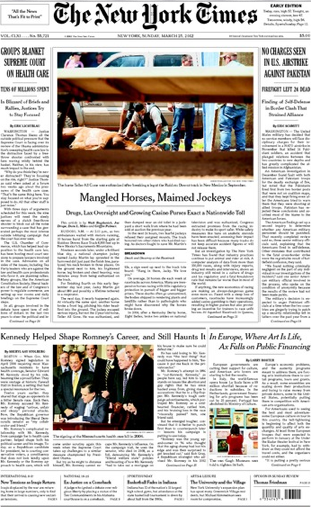 The March 25, 2012 edition of the New York Times carried a multi-page story detailing horrendous lack of oversight at America’s racetracks, and indicted the horse racing industry for allowing greed to overtake common sense and common humanity, placing the lives of horses and riders at risk every day. Although it is impossible to disagree that there are problems in America’s racing industry, reaction to this article is divided, in part, as horsewoman Melinda Rice Moss writes below, because there is simply no mention of the men and women doing the right thing with their horses; according to the New York Times, it’s all bad news. And that, she maintains, is an annual rite of spring. I am a ninth generation Saddle Fitter, but more importantly, my family owned racehorses and I grew up on the Maryland tracks. I worked as an exercise rider, groom, you name it. I even had an exercise rider’s license at Bowie before I had a driver’s license. Throughout my adult life I have stayed in the Thoroughbred racing business in one form or another. 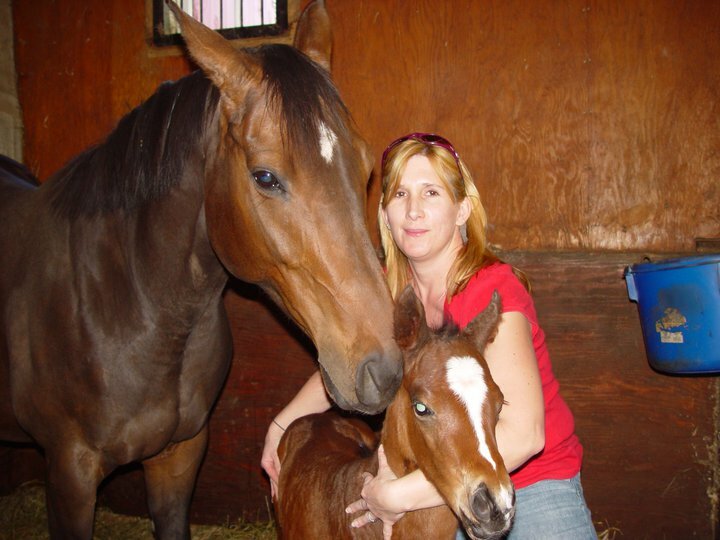 In 2009 I moved to NY to be with my fiance, Dr. Bernardo Mongil, DVM, a 4th generation horseman; at Monhill Farm we stand stallions; breed, raise, race and train Thoroughbreds. One look at our website and you will understand that we are the die-hards who always try to do right by all our horses, even retiring them sound and placing them in homes for little or no money after their race careers. Does there need to be better regulations and stiffer penalties in horse racing in the U.S.? Absolutely. Even the racetrack vets should be held more accountable, as they often see and treat many of the horses not just on race day, but also for pre-race checks. I agree, with the influx of slots and casinos there has been an increase of a lesser class of horse running for higher purse money, whereas before the slots were introduced those same horses may have been retired. 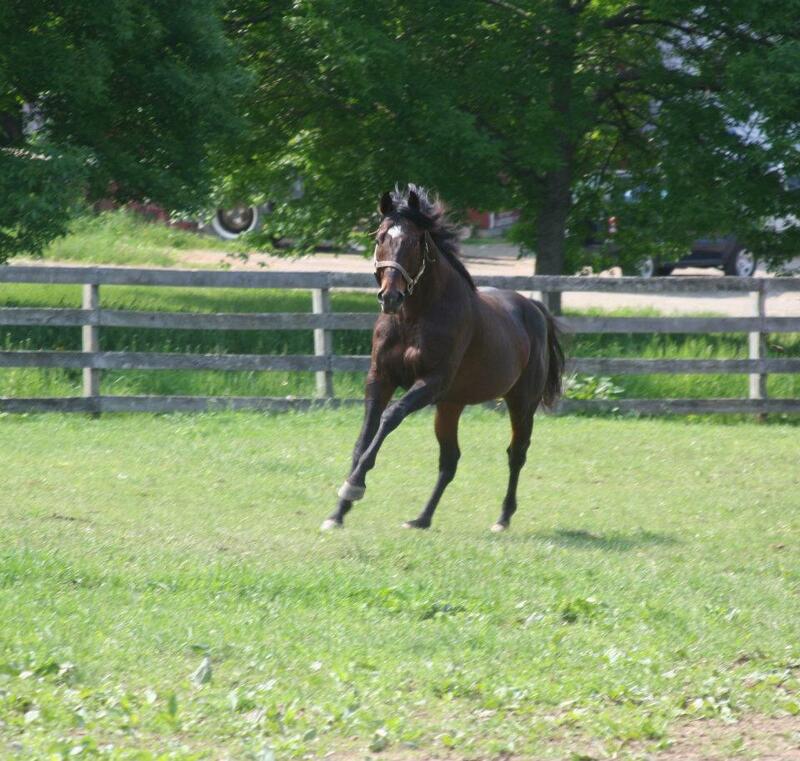 Griffinite, a young sire at Monhill Farm, was a rescue from the infamous Paragallo abuse case. The money from the casinos that goes back to funding the racetracks needs to be better distributed with some sort of financial program(s) set aside for retirement of ex-racehorses (a legit, regulated one—which by the way is in the works, or so I hear), better drug testing and research, etc. If you keep up with the racing industry publications, these are the same topics that have been discussed for many years. Thoroughbred racing used to be “Old” Money, a “Sport of Kings” where the elite participated and only the best of the best competed. Unfortunately, in the last fifty years racing has fallen behind the rest of the major American sports (NASCAR, football, baseball, etc). For many, many years Thoroughbred racing refused to accept sponsorships (a big mistake compared to what all other major sports have done), and so since the late 1980’s, the sport has gone through a major downturn, and had all but died out, until the installation of slots came along; hence the many new problems with illegal medications, trying to “pump” up the horses to make them more competitive, creating an even bigger problem as the article speaks of. However, as in every sport there are the good, the bad, and the downright lowlifes. It seems that every year about this time—Spring, when all the big money races and the Triple Crown Trail come up—there is someone (often times PETA and some so-called “rescue” organizations, as well as the journalists trying to make waves) that come out with new “news & stats” trying to knock down the sport. It seems to me that in that five-page article there was more negativity about the sport than an attempt to create awareness of the big picture of racing. As my mom used to say: “Bad news travels ten times faster than good news!” The media always latches on to the tragedies, and not just in horse racing. What about all the great every-day feel-good stories on the race track (or in the world in general)? We don’t often hear about those types of stories. Rarely does the media recognize the Breeders/Owners/Trainers and all the staff behind the scenes that care for the not-so-sound horses, or those that just need extra TLC; people (even grooms and riders) who spend their hard-earned money, even taking food off their own table, to care for a horse that needs extra care, in order to be rehabilitate it for a second career after the races or just for retirement. Not every race horse breaks down, gets destroyed by uncaring trainers or owners, and/or gets “dumped next to an old toilet in a junkyard” as the article so pointedly stated. A Griffinite filly stretches out her legs at Monhill Farm. Bernardo (who is also an equine vet) is a good example of an Owner/Breeder that truly tries to retire his horses sound for second careers, refuses to race a horse that is unsound, and always tries to do right by the horse. My friend Robin, whom you met via the Retired Racehorse Trainer Challenge, does the same. She also follows her horses (as Bernardo does) after their careers. There are just as many GOOD Breeders/Owners/Trainers for every bad one the media talks about. I honestly can name more “Good” people in the industry than “Bad”. It is we “die-hards” who truly love our horses and do right by them, which is why I am such an advocate for the racehorse. Most racehorses are treated better than the average backyard or lesson horse. These types of articles and the people that try to knock racing down really aggravate me. What Thoroughbred racing needs now is a new generation of Owners/Breeders/Trainers that understand and support racing, and the horses, for what it is, and a commitment to help better regulate it. What some readers may not know is that the exact same situations (horses that break down, are mistreated, dumped at slaughter houses, or unsound, or horses with severe training issues are passed on to uneducated or unsuspecting “new” owners) are very common among all the other equestrian sports—the Western Show/Reining Quarter Horses, the jumpers, the Eventers, the Dressage horses, it happens everywhere! Show horses snap a leg while cantering in a show ring, or step in a groundhog hole with or without a rider. The reality of dealing with horses, is that accidents happen all the time. The difference is that other equestrian sports don’t have anywhere near the same regulations or penalties, nor do they get the same media attention, as horse racing. How does the old saying go? Believe half of what you read and all of what you see? This is Sunday Book Review day, but I’m afraid things have to diverge from the usual editorial calendar. Let’s talk about the New York Times story, shall we? If you don’t know what I’m referring to, it’s this: an investigative report from Joe Drape, Walt Bogdanich, Dara L. Miles, and Griffen Palmer, published in today’s edition of the New York Times, entitled Breakdown: Death and Disarray at America’s Racetracks—Mangled Horses, Maimed Jockeys. And it’s just as awful as the name would indicate. Joe Drape is the most familiar name on the list of contributors for me, anyway; he is the Times’ most active horse-racing correspondent and a fairly regular face on Twitter (@joedrape). But I usually see Drape’s byline on the Sports page: occasional racing stories, or the Triple Crown-season feature The Rail. This piece isn’t on the Sports page. This is the headliner of today’s New York Times. I was excited when Neville Bardos made the front page, period. But this. . . this is something else, altogether. If you get to the webpage and can’t get past the photo of the abandoned Quarter Horse gelding, Teller A Gone, lying in a Ruidoso, NM, junkyard, I forgive you. It isn’t a terribly graphic picture, to my mind; for one thing, if you’ve been with horses for any length of time, you’ve probably seen them die, and for another, this one could be mid-nap, for the uninitiated (or illiterate). Not to mention the New York Times regularly runs horrifying gory images of humans in various stages of dying, death, or decomposition, and this is, if you’ll pardon the term, “just a horse,” without any bullet holes or gaping wounds or flies buzzing around its dried tears. But I don’t think readers are going to view it that way, and who can blame them: in America, animals, especially those that the average American would generally think of as a “pet,” are a hands-off area. Don’t mess with our dogs, our cats, or our horses, Americans say, again and again. It’s never “just a horse” to the casual, uninvested reader, and such a phrase could start street fights amongst the horse-owners in the suburbs. In short, this isn’t going to go over well. If you can get past the photo, read the article first, and then make your own judgements about whether or not you can click on the photo. Because it’s really a link to a five-minute documentary video, and you can fit a lot of breakdowns into five minutes. Horse after horse after horse goes down. There’s no blood, it’s just race replays, the kind you pull up yourself on the Internet. If you wanted to. I wouldn’t. It’s amazing how much it hurts, how it never gets better. The sick feeling in your stomach when a horse goes down. There is footage of Archarcharch hobbling to the ambulance after the 2011 Kentucky Derby. I tasted coffee in my throat where there should not have been coffee. I wiped a tear away. Seeing horses in agony is a trial you never learn to live with. There are really great quotes in the video, especially from state vets at Finger Lakes, who are frustrated and saddened by the horses who are entered into races on the verge of falling apart. But then again, there are the breakdowns. So maybe don’t watch the video. You don’t need to. You know. We know. Preach to the choir, but we know. I’ll bet if I go in there tomorrow morning, he’ll ask me about it. Someone is going to ask you about it. People are going to be talking. It’s going to get ugly. Uglier, really, than it has been. Uglier than the PETA videos. Uglier than the cancellation of Luck. We’re heading into Triple Crown season, the only time of year when horse racing makes any sort of media presence known at all, with the truth breathing down our necks. Horses die, with alarming ease and inventiveness, on any given day in any given sport. But lower-level claimers running in the United States of America die far too often. Is this report good, or bad, for racing? I don’t believe in sitting on fences. Maybe it’s because I always lined the top board of my fences with electric tape. Whatever the cause, I like to force myself to make a decision, to climb off the damn fence. I won’t sit on the fence on this one, and say, Well, on one hand, it’s important that these issues are raised, but on the other hand, the media is continuing to demonize horse-racing by only showing the bad, and penalizing horsemen by chasing people away from the track, lowering handle, and continuing to lower horse-racing’s esteem in the public eye, and that is simply going to lead to tracks shutting down, people out of work, horses out of work, and valuable research dollars being lost that are funded by horsemen groups and organizations like the Jockey Club, meaning that veterinary medicine will lose ground in its fights against injury and disease. I’m going to clamber off the fence on the Good side. This is a good article. This is an important, thoughtful, eye-brow-raising article, which examines real problems, concludes that break-downs are linked to drugs, and then talks to invested people on both sides of the drugging debate, and examines the moves that have been made to clear our horses of drugs and the counter-moves that have been made in resistance. It also pushes the need so many fans and horsemen alike see, for a national governing body for horse racing. State-run racing commissions oversee horse racing, and again and again certain commissions prove that they are not policed, they have no teeth, and they are not willing to go to bat for horses. If there isn’t going to be a national governing body to say “This is how things are going to be done,” then they are going to continue, especially at cheap racetracks like Ruidoso Downs, to offer high, casino-financed purses to horses that are being held together, for the sole purpose of winning those purses that are several times their financial value, with every kind of drug they can get into that horse’s system. One of the first things I learned about horses and veterinary medicine: if you suspect colic, don’t give your horse Banamine until the vet has seen the horse, because Banamine masks pain. Apparently, that’s one of the first things some of these trainers learn as well. They just use that information differently than I would have. The safety of horse and rider is going unanswered, but I think it’s safe to say that no one in the racing office is ignoring calls from the casino organizations. Purse money has become the paramount concern of certain racetracks: not attracting new fans, or protecting the lives of the animals and people who go out on the track themselves. Purse money, the great band-aid, keeping bad horsemen in business while the racetrack visitors turn left at the casino entrance and never even consider the horses on the oval out back. Are casinos going to keep racing afloat long enough for industry leaders to fix its problems, or are casinos going to simply hasten its departure? Mr. Stirling [chairman of the national medication committee for the Horsemen’s Benevolent and Protective Association] and others say sore horses should not be denied therapeutic medicine when needed. “If you’re a horseman and you’re trying to keep a horse going and keep him happy and healthy as you can, then these therapeutic medications are very helpful,” he said. Mr. Stirling is making the case for broke horsemen everywhere, who have to run a horse as often as possible in order to make a buck, or make a living, whatever the case may be. While I know it’s hard to make a living with horses, in whatever business, I disagree categorically with anyone who thinks it’s acceptable to dose a horse with a painkiller and send it out, whether to jump a Grand Prix course or run a race. I side whole-heartedly with Mr. Hancock on this issue. In the end, of course, you can look at this as just another story taking horse racing out behind the woodshed while other horse sports go on their merry way. I have yet to see a New York Times article on the drugging debate in the hunter show-ring. No one has opined on the trainer who wrote in the Chronicle of the Horse that everyone going into the hunter division should just be allowed to legally tranquilize their horses and save themselves the trouble of finding work-around sedatives that aren’t found in blood-tests yet. I’d say it’s because horses don’t die in the hunter division because of drugging, but of course, that isn’t true. It’s because hunters are not a betting sport, because hunters are not televised, because they do their dying in private, respectably, not out on a public track with the sort of people you wouldn’t let your horse-crazy daughter anywhere near cheering them on. But racing is the sport that gives all other horse sports their advances in technology and, ironically, safety. 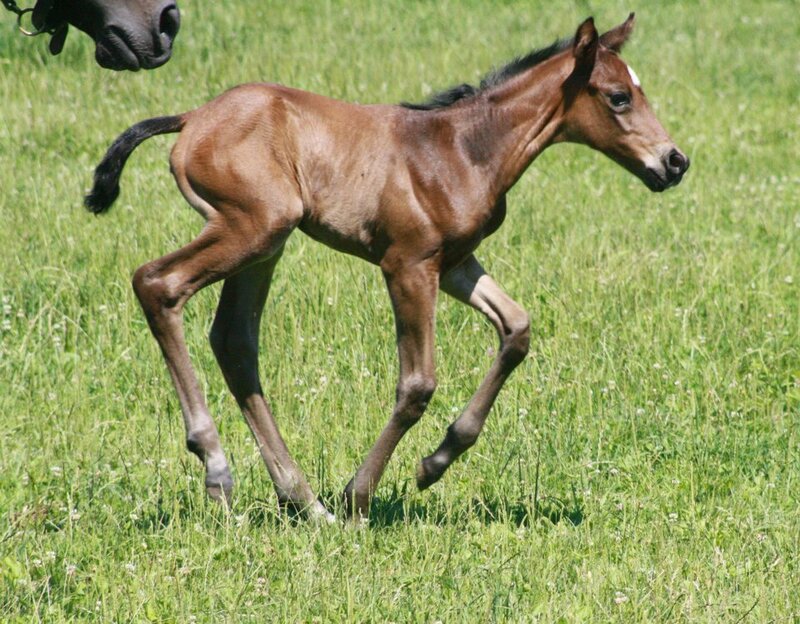 Horse racing dollars fuel the veterinary research studies that save premature foals, bring back horses with soft-tissue injuries, rescue horses with previously fatal injuries. Look at Neville Bardos, brought back from the brink of death, a recovery largely credited to hyperbaric oxygen treatments. 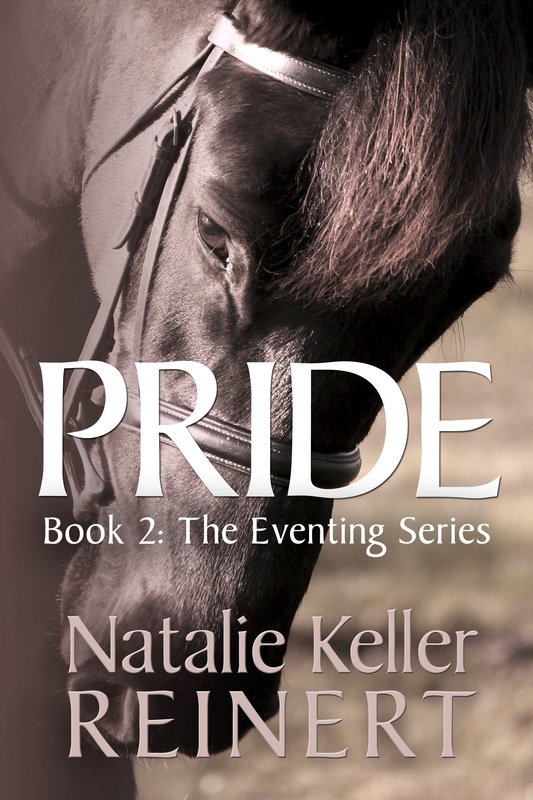 A therapy that started, where else, with racehorses. While justifiably railing against the New York Times may make you and me feel better, venting won’t do anything except expend negative energy. People who genuinely care deeply about the sport of horse racing–and the animals and humans involved—need to reform the sport, regardless of whose toes get stepped on in the process. Especially work to rid the sport of race-day medication and the thugs who give racing a bad image. Especially do everything possible to make racing surfaces safer for jockeys and horses. If a racetrack surface temporarily goes bad due to weather, or whatever, cancel the day’s races. Get angry about images of dead horses and sensational writing if you want. But then admit that it is broken, and work towards fixing it. Click here for: The New York Times, Mangled Horses and Maimed Jockeys.